Expedia can help you save with a Gili Trawangan travel package. With all that extra cash in the bank, you might even like to book a few more nights. Would you like to earn savings up to 40,450 YEN*? Book your family's travel package on Expedia now! Search through our comprehensive database of more than 400 partner airlines and 321,000 properties worldwide. Too many on there to choose from? Don't worry — we can help you decide! Feel free to cancel or make changes to almost any hotel reservation and you won't have to pay a cancellation fee to us. It can be enjoyable to just roam the streets in a new place, but sometimes it's sensible to make a plan. Grab your travel schedule — we have heaps of fantastic ideas for your impending Gili Trawangan vacation. Are you eager to understand more about precious species? Book yourself into a guided tour at Gili Meno Turtle Sanctuary and take the opportunity to witness these beautiful animals up close and personal. Adventurers in this destination have heaps of options. Are you excited to learn more about precious wildlife? Book yourself in for a guided tour at Gili Meno Bird Park and relish the chance to behold these beautiful animals up close. Still have some time to spare? An excellent way to truly get a taste of a region's culture is to spend time at its lively marketplaces. Peruse the produce and shop like the local people do at Gili Trawangan Night Market. Do you want to make some terrific memories? A trip away is the ideal time to try some amazing new experiences. 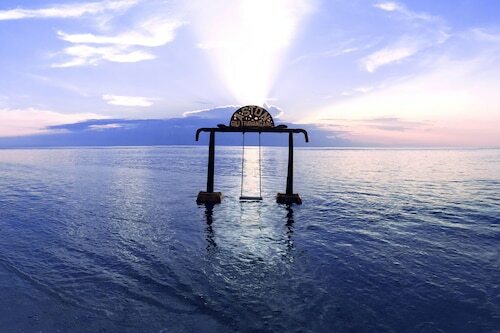 For more activities, take a look at our Gili Trawangan things to do page. Wind up your day of activities with a nice comfy bed and a fluffy pillow. 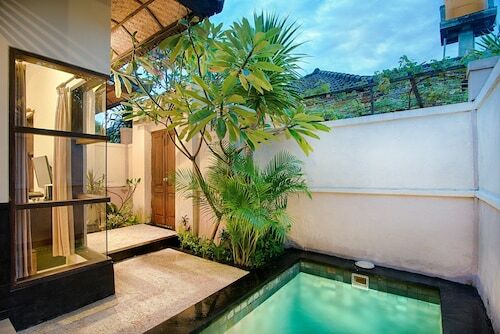 View the 111 properties in Gili Trawangan available via Expedia and pick one for your cheap vacation or luxury getaway. If you're the sort of person that can't fall asleep unless they have high thread count sheets, why not snuggle down in luxury at The Lombok Lodge (Jl. Oberoi, Desa Medana) or The Oberoi, Lombok (Medana Beach, Tanjung)? If you'd prefer to spend your hard-earned money on things such as thrilling adventures and rowdy nights out, why not investigate a few of our low-cost options? The Martas Hotel Gili Trawangan (Gili Trawangan) and the Seri Resort Gili Meno (Pemenang, Gili Indah) are a couple of recommended ones. Working out the logistics of your trip to Gili Trawangan? Wondering where you'll be flying into? Lombok International Airport (LOP) is the closest terminal. Once you've touched down and departed from the gate, you'll be 35 miles (56 km) from all the main streets. 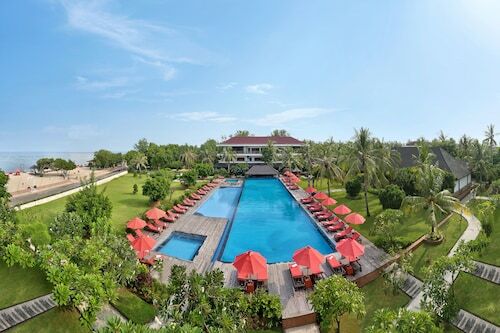 Situated on the waterfront, this spa hotel is 0.8 mi (1.3 km) from Gili Trawangan Turtle Hatchery and within 3 mi (5 km) of Gili Meno Turtle Sanctuary and Gili Meno Bird Park. Located in Gili Trawangan, this beachfront resort is on the boardwalk and within 1 mi (2 km) of Public harbour ticket office and Gili Trawangan Harbor. Gili Trawangan Turtle Hatchery and Gili Trawangan Hill are also within 1 mi (2 km). Nestled on the beach, this Gili Trawangan resort is 1.2 mi (2 km) from Gili Trawangan Hill and 1.7 mi (2.8 km) from Gili Trawangan Harbor. Public harbour ticket office and Gili Trawangan Turtle Hatchery are also within 2 mi (3 km). 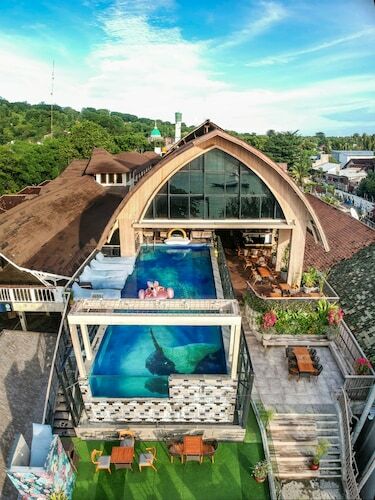 Located in Gili Trawangan, this beachfront hotel is in the entertainment district and within 1 mi (2 km) of Public harbour ticket office and Gili Trawangan Harbor. Gili Trawangan Turtle Hatchery and Gili Trawangan Hill are also within 15 minutes. Nestled on the beach, this Gili Trawangan resort is within 2 mi (3 km) of Gili Trawangan Hill and Gili Trawangan Turtle Hatchery. 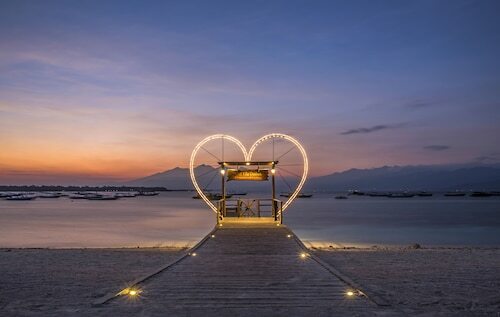 Nestled on the beach, this Gili Trawangan resort is 1 mi (1.6 km) from Gili Trawangan Turtle Hatchery and 1.4 mi (2.3 km) from Gili Trawangan Harbor. Public harbour ticket office and Gili Trawangan Hill are also within 2 mi (3 km). Nestled on the beach, this Gili Trawangan hotel is within 1 mi (2 km) of Public harbour ticket office and Gili Trawangan Harbor. Gili Trawangan Turtle Hatchery and Gili Trawangan Hill are also within 15 minutes.